THE WRITING BUDDHA - Opinions | Books | Movies: The Unbreakable Law by Pragat Kasana (Book Review- 4*/5) !!! 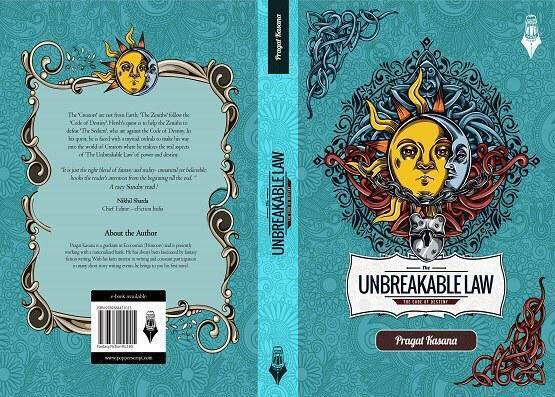 The Unbreakable Law by Pragat Kasana (Book Review- 4*/5) !!! 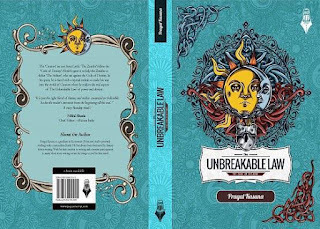 I have read my first book published by PepperScript which is the debut work of Pragat Kasana. Unlike other authors, this author has little social media following already because of his interesting tweets and this ensures me that his book shall do well in coming future. The cover page of the book is beautiful and it will surely grasp eyes of few readers. Fortunately, the book is a perfect page-turner and a book that can be read in one go. I picked it up last evening and kept reading it till 4.30 AM in morning. It's just 200 pages thick but takes a lot of time for you to grasp as most of the names and places are named by the author himself; because the book belongs to the fantasy fiction genre. Pragat Kasana's writing style is very fluid and he has good command over the language. He divides the chapters perfectly so that you do not get cluttered in the long fantasy story that it is. I liked the author's idea of mentioning main characters initially itself which many authors fail to do so. I made a hierarchy tree according to the description of the characters which helped me understand the story better. The characterizations are wonderfully created by the author and even after you complete the book, you will think about couple of them. Even the unusual animals and creatures that the author have described are powerfully portrayed and you can imagine them easily. As a debutante, I feel Pragat have hit at the right place. Author have tried to put in some philosophy intelligently without being preachy. He wittily tells how sadness, anger and stress of a person can benefit the people who are looking for their failures. He amazingly builds a great scenario and shows how a father cares for his son even when they do not meet each other since the child's birth. Author also manages to say how even good people go a wrong way to attain some power which can make them look stronger and right in society. Also he speaks about how historical facts are distorted according to who wins the war and future generations get to know only about how their forefathers were right and everyone were wrong. I liked how the book is ended with a cool climax. But I want author to write something else next time rather than writing sequel to this book. :-) I give 4 stars out of 5 to this book for its originality and creativity.